In the latest mobile focused podcast with Benedict Evans and myself, we touched on a theme that needs more fleshing out. That of a future only possible because of mobile computers/smartphones. When I detail the mobile first world in articles, presentations, and reports, what I highlight is not only the impact but the necessity of mobile to move computing forward. The PC in the shape of a notebook or desktop took computers as far as those shapes would allow. There are very few new users for PCs of that design. The PC in the shape of a tablet can take computing even farther, particularly in business environments, and that form factor gets a PC into the hands of more people. The PC in the shape of the smartphone, however, brings computing to everyone. Perhaps more importantly, the smartphone can bring the internet to everyone. More revolution will come from the PC in the shape of a smartphone than from any previous computing product in history. It is because of this, we will see countless opportunities emerge and it is a future only possible because of mobile. The smartphone opens the door to new possibilities because it is the first time the technology industry is accessible to everyone. In fact, over the next decade or so, we will watch smartphones become a commodity. Estimates are, by 2020, quality, powerful smartphones could cost $10. The mobile web is already bigger than the desktop web and, in a few years, the mobile web will dwarf the desktop web. It is a cold hard fact, the future of the Internet is mobile. This reality brings out some interesting implications. There was a debate last year around the disparity between iOS web browsing and Android web browsing. It seemed a conundrum — Android had 2x the user base but much less of the global browsing share. 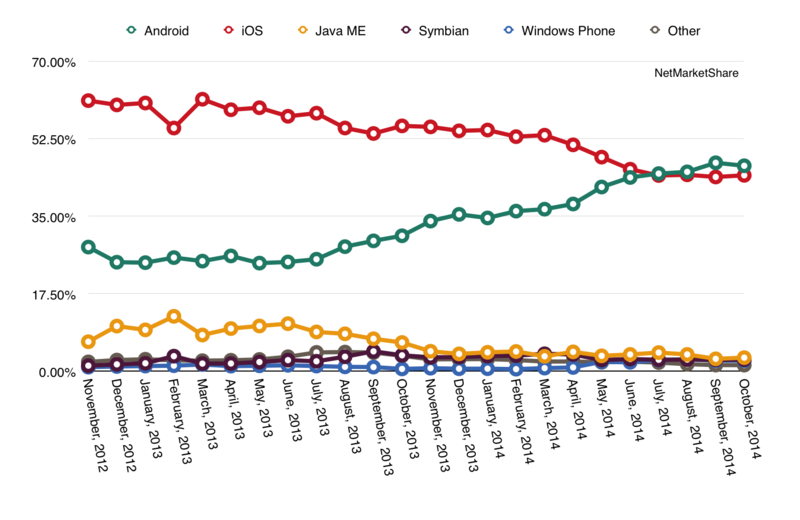 As you see from this chart from NetMarketShare, only recently has Android overtaken iOS in global web browsing share, and it is still very close. When we include Android AOSP and Google’s Android, there are well more than double the active devices compared to iOS. But why did it take so long? There are many theories but there is one in particular I find insightful and adds a bit of needed clarity to the global mobile web discussion. The bulk of Android’s growth and market share is in the lower tiers of smartphone price bands. My estimates put premium Android price tiers at roughly 15% of the global Android installed base. Meaning much of Android’s installed base globally consists of non-premium/lower price tier smartphone users. This explained quite a bit of the global web browsing paradox. Apple has a significant installed base of premium users, larger than Google’s premium users, and those customers spend more time browsing the web and consuming internet data. As I started researching the mobile web in emerging markets, it became clear one of the factors for this disparity was, because of Apple’s premium customer base, this audience could afford to liberally browse the web. Where much of Android’s installed base, having to deal with pricey and slow internet connection times, and no wi-fi at home, could not. 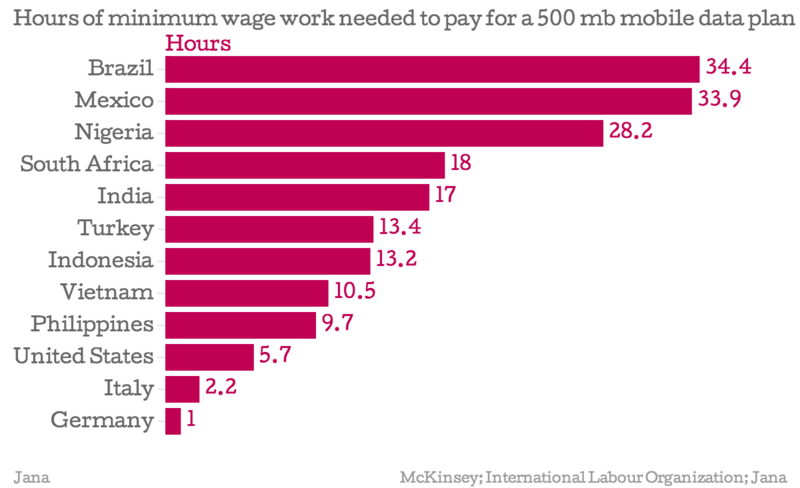 This insight becomes even more clear when we look at this chart from Jana.com showing the number of hours of minimum wage work required to pay for the average data plan. Due to the infrastructure challenges in many of these markets, consumers are very aware of not only how much data they are using, but also the size of the application they are downloading. This is a fascinating quote from a post from LightSpeed Venture Partners, an investment firm focused on India. It is becoming clear the high cost of data plans in many emerging markets are influencing how they use the mobile web and the apps they use and download. Understanding this leads me to consider the role web apps may play in these markets. There is a web app called Zomato, which is sort of like Yelp for India. Zomato is a great example of a light application that is useful via a web app in those regions where light applications are necessary. It is true native apps are still dominant in these markets, however, we are still dealing with only the top 30-40% of the global mobile audience that has a smartphone and a data plan. As we extend that reach into the broader 60-70%, a healthy portion of those customers will be even more sensitive to the costs of data and size of applications they consume. This is why the “light web” is a reality for the next billion users. Whether by lighter/more efficient native apps or, as I believe, web apps, the light web is better positioned for the next billion. Interestingly, even Uber has a robust web app. It is possible the powerful cloud and light, thin client computing paradigm is destined for emerging markets. It is clear, thanks to PCs in the shape of a smartphone and the inevitable inclusion of robust sensors in these devices even at low prices, that we are heading to a fascinating future not only made possible because of mobile devices but empowered by them. This future will pose great challenges to many incumbents but even greater opportunities for the innovators.